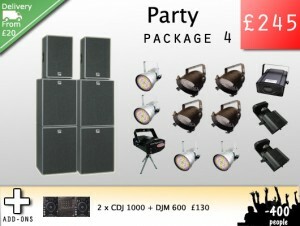 Party Sound Hire from Audiocrew. 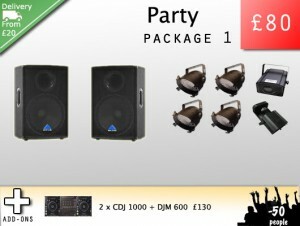 Hire Speakers for your party. Over the years we have recognised the need for simple Party Sound Hire packages for parties. These packages are very easy to set-up yourself although delivery and set-up can be arranged at a small extra cost. 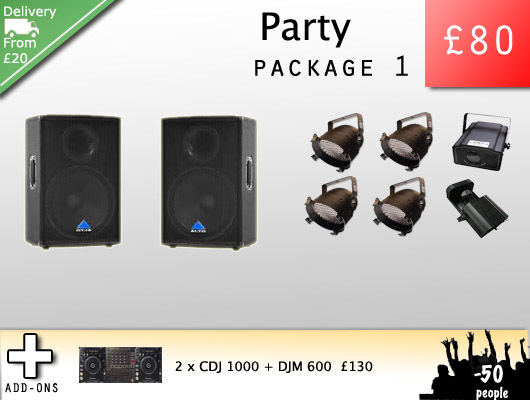 Plug in your mp3 player, CD Decks, Vinyl or laptop to these party sound hire speakers and lighting for a night to remember! 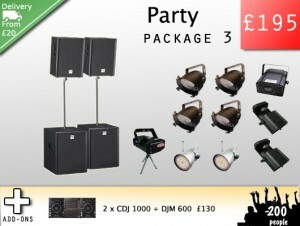 Here are some Party Sound Hire packages featuring our most asked for sound equipment, speakers and lighting for parties. If you are looking for packages without lights to plug into an ipod, laptop or similar mp3 player click here. 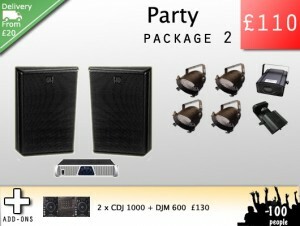 To find out what the lighting looks like, check our lighting demo section.